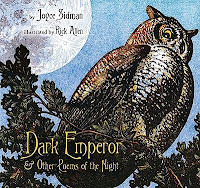 Dark Emperor & Other Poems of the Night begins with “Welcome to the Night,” an invitation in verse “To all of you who crawl and creep, who buzz and chirp and hoot and peep.” It’s an evening summons to the animals that wake at dusk to go about their nighttime business, enjoying the cool, damp shadows. 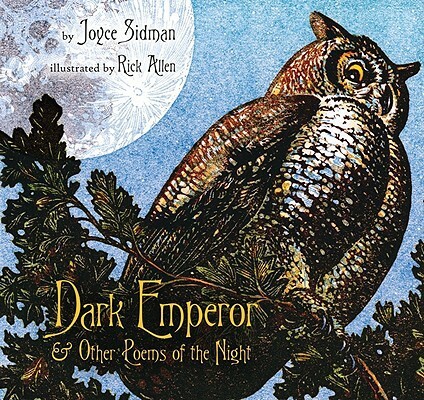 Poet Joyce Sidman then introduces readers to woodland snails, the primrose moth, raccoons, porcupines, the red eft, and even the Dark Emperor himself, the great horned owl. Among other animals, there are also poems that mark the coming of the mushrooms and the silent strength of the oak tree. The book closes with “Moon’s Lament,” where our lunar friend reflects on the night’s events, questions where everyone has gone, and mourns the dawning of a new day. Dark Emperor could well stand on its own as a book of poems, but the addition of short paragraphs of nonfiction coupled with each poem pushes it to a new level. 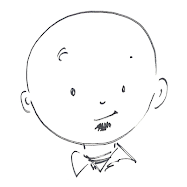 Each poem appears on the left of the two page spread with a small illustration. The right side features a larger illustration (all stunning, I might add, and giving the book an appearance traditionally associated with Caldecott winners rather than Newberys) and the descriptive text. Readers not only are given a lyrical tour of the nighttime forest, but also learn more details about the poems’ subjects. Did you know snails have teeth on their tongues? Did you know that while trees produce food during the day, they use the hours of darkness to make repairs and take in extra water? Did you know that baby porcupines are called porcupettes, that cricket sounds peak around midnight, or that one mushroom can produce two billion spores? Hmmm? Me neither. Until now. Just like Sidman’s previous books, Red Sings From Treetops and This Is Just to Say, Dark Emperor will come alive in a teacher’s classroom. In one book teachers and students will hold in their hands lessons in rhyme and rhythm, imagery and word choice as well as facts about the creatures, both big and small, quiet and loud, of the night.